I always enjoy looking back on the athletic year when I do these end of the year recaps and recognition. I recall many of the things that have happened over the course of September 2016 to August 2017, such as the exciting battles at the various Heps championships that resulted in the Harvard women winning their first ever “Triple Crown”, the Penn men winning their first Heps XC team title since 1973, and the Princeton men overcoming some big obstacles to win both the Indoor and Outdoor Heps titles in exciting fashions (like in the image above). A freshman won the world junior title in the triathlon? 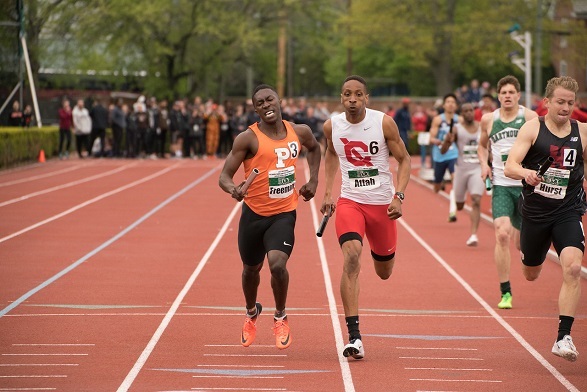 A Heps alum is now one of the fastest in the 600m in USA history? A Heps coach and former athlete entering the USTFCCCA Hall of Fame? Cornell opened up their revamped indoor track at Barton Hall? The passings of a student-athlete, a former Heps champion/coach, and the man to revived track & field in NYC ? Remembrance of a fallen space Naval cadet? Five individuals and four teams qualified for the NCAA Cross Country Championships? With two individuals earning All-American honors? Eleven individuals qualified for the NCAA Indoor Championship? Resulting in two First-Team honorees? Twenty individuals advanced to the NCAA Outdoor Championships? And we got one national champion and three other First-Team honorees? Six HepsNation athletes to the IAAF World Championships, and 1 World finalist? If not, use some of those links to help refresh your memory. I looked at many of those links and more in order to determine and write up our Athletes of the Year honors. Check them out below. Of course, this is only a snapshot of what happened during the 2016-17 seasons as there are many more historic firsts or bests, ups and downs, and memorable moments that happened in HepsNation. We will keep track of those moments as best as we can for the 2017-18 seasons so we can document it for the next generations of our unique community. Thank you to everyone for making these memories and helping us share it among HepsNation. This entry was posted on Saturday, December 23rd, 2017 at 8:00 am. It is filed under Alumni, Athletes, Awards, Featured. You can follow any responses to this entry through the RSS 2.0 feed.